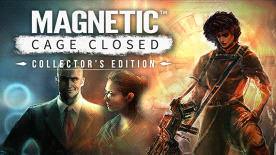 The Magnetic: Cage Closed Collector's Edition comes with a comprehensive Digital Artbook, Full Digital Soundtrack, and Two New Devious Challenge Maps. Mouse with scroll wheel suggested for a smoother gameplay experience. Supports Xbox 360 compatible controllers.